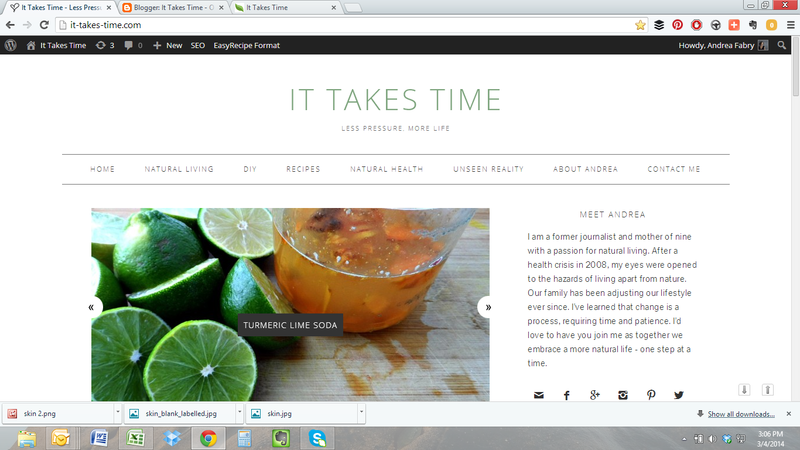 I am excited to launch an all-new It Takes Time! This updated and revised site offers new recipes, tutorials and suggestions for making healthy change -all in the context of less pressure. Check out It Takes Time here. 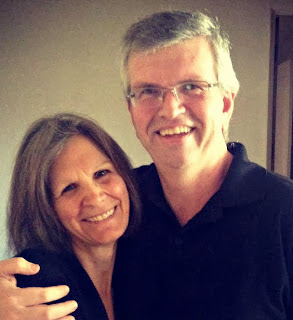 I began my Mold Recovery blog in 2008 as a means to keep others updated about our journey - a journey that began soon after we made the connection between our health issues and toxic mold. I soon sensed a need to share more than our journey as many others were experiencing issues due to toxic mold. My area of interest has expanded to include issues surrounding food, pesticides, and healthy living in general. I'd love to have you join in the journey! Subscribe to stay in the loop of what's happening with It Takes Time. Baking soda is the ultimate cheap, safe ingredient for beauty care. I recently listed 4 ways to use baking soda over at Adrienne's Whole New Mom. One of my favorites is microderm abrasion.Stephanie Tourles, author of Organic Body Care, says this recipe rivals expansive spa treatments. 1. Combine in a bowl until you have a velvety slurry. 2. Dip the pads of your fingers into the slurry and lightly massage your face and throat. Do not use much pressure. The granules of the baking soda will do the exfoliating work. 3. Continue to dip fingers into the slurry until the entire skin is covered with a thin coat. Helichrysum essential oil is expensive but it will last for more than a year. Helichrysum promotes wound healing, stimulates digestion, boosts the immune system and much more. I buy mine here. 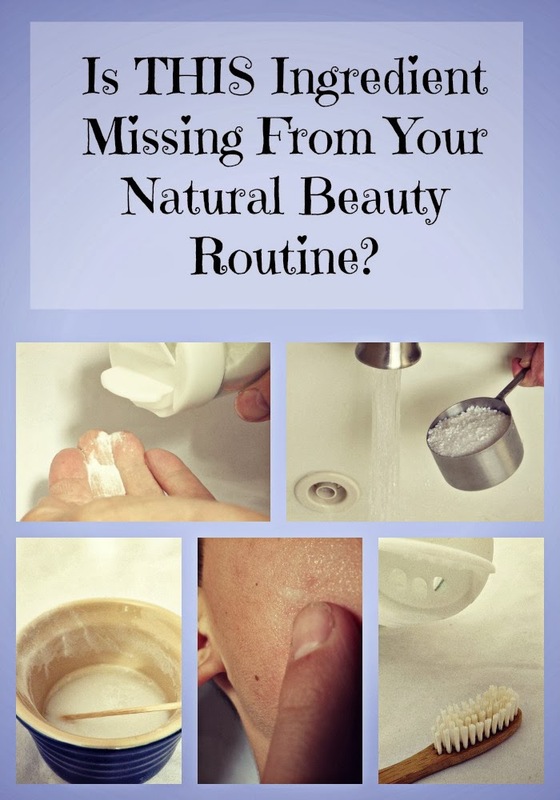 To see the other three tips for using baking soda in your beauty care see Is THIS Amazing Ingredient Missing From Your Natural Beauty Routine? Do you find yourself confused by the different options for sweetening your food? Wondering if unrefined sugar is truly better than refined white sugar? Is honey better than agave? How about xylitol or stevia? One of the key considerations is the amount of fructose, which gives food its sweet taste. 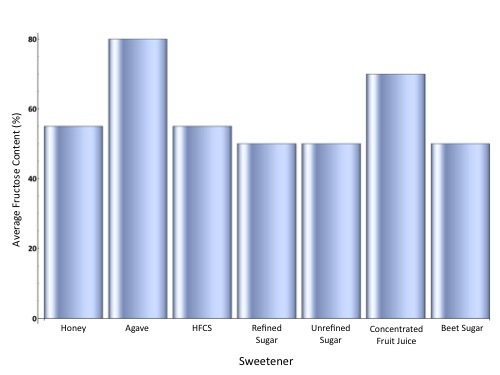 Fructose makes up 50% of table sugar, and occurs naturally in fruits and even some vegetables. Fructose, like alcohol places a burden in the liver. Unlike alcohol, fructose kicks the liver into fat storage mode, which can lead to insulin resistance and obesity. The resulting metabolic syndrome is perceived as a lack of discipline or willpower, when in fact the problem is biochemical. The key it seems is keeping sugar in its place. . Historically, sugar has been considered a special treat rather than an entitlement. Dr. Robert Lustig, author of Fat Chance, Beating the Odds Against Sugar, Processed Food, Obesity, and Disease says it's best to stick with fructose in its natural form. "Naturally occurring fructose comes from sugarcane, fruits, some vegetables, and honey. The first three have way more fiber than fructose, and the last is protected by bees. Nature made sugar hard to get. Man made it easy to get." We made it very easy to get when we invented high fructose corn syrup in the 1970s. HFCS is processed with chemicals such as caustic soda (which may or may not contain mercury), alpha-amylase, hydrochloric acid, and isomerase, using corn (likely to be genetically modified) as its substrate. The corn starts out with no fructose, but after the enzymatic process yields a substance that is 55% fructose and 45% glucose. Clearly, HFCS comes with a set of risks. However, the fructose content is virtually the same as table sugar. Therefore, avoiding HFCS may be a good step, but not the solution. Some of the highest concentrations of fructose occur in unexpected places. Fruit juice concentrate can go as high as 90%, depending on sugars added or the type of fruit used. Apple juice concentrate is about 70% fructose, while orange juice concentrate comes in at 50%. Agave nectar is derived from the yucca family of plants and requires high amounts of processing to convert the root bulb into syrup. The process is not unlike the one used to convert cornstarch into HFCS. Depending on the process used, the fructose content can range from 55% to 90%. Sweeteners like aspartame and sucralose (Splenda) are 100% chemically derived and thus present a challenge to our already overburdened cells. These chemical compounds easily cross the blood-brain barrier, carrying with them the potential to do neurological damage. 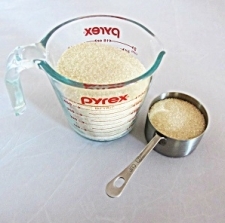 Unrefined sugars include sucanat, rapadura, and turbinado. Rapadura and sucanat are similar dehydrated sugarcane juice products. Both retain the molasses. Turbinado adds the extra step of removing impurities and surface molasses with a centrifuge. Sugar alcohols such as mannitol, sorbitol, and xylitol are neither sugar nor alcohol, but do add sweetness. All three occur naturally in various fruits and vegetables; however, sorbitol is most often produced from corn syrup. These substances are not fully digested by the body and can lead to abdominal pain, cramping, or gas. Other options worth considering are stevia and lo han. Lo han is derived from the Chinese monk fruit, while stevia is an herb native to South America. Both can be found with varying degrees of processing, but do not carry the fructose burden common to other sweeteners.Keeping sugar in its place, unrefined or otherwise, can go a long way toward protecting our health. As I look as this list, I clearly see our dependence on processed foods. 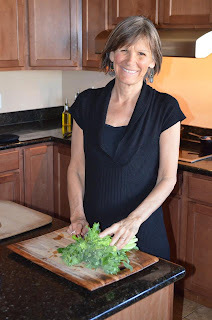 Because of our health crisis, I was attempting to make some better choices with the addition of "natural" and "organic" products—but the food was still in a box or a can, with a long list of unpronounceable ingredients. This post shared at Wellness Wednesdays. 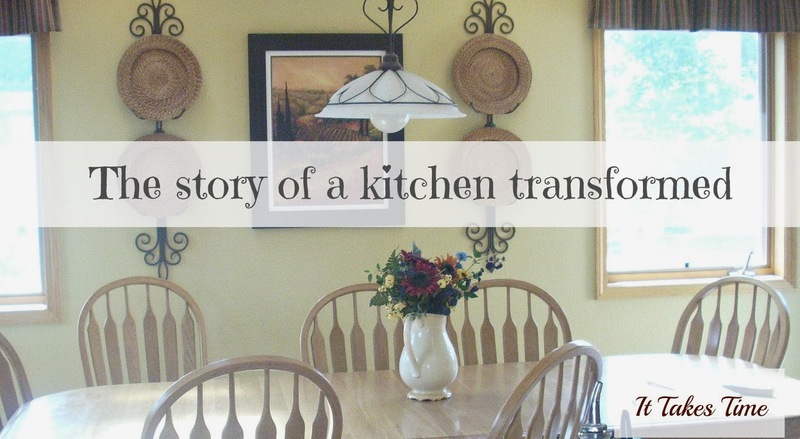 Below is a tour of our kitchen now. The contrast reminds me that change doesn't happen overnight. It happens one box of Stove Top Stuffing at a time. I haven't used shampoo for 4 years. I’d like to keep this a secret from TODAY's Kathie Lee and Hoda, however. If they find out they might laugh and ridicule me like they lambasted Jacquelyn Byers. 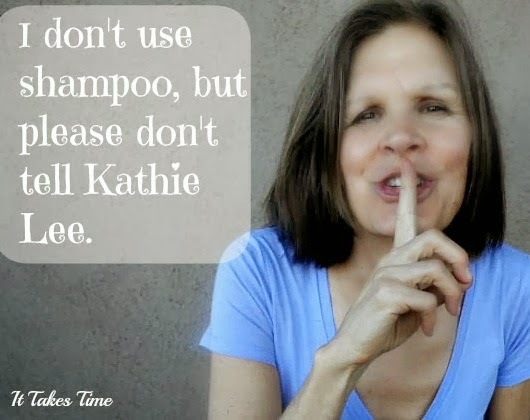 Jacquelyn has written about her decision to stop using shampoo on her blog Little Owl Crunchy Momma. The media picked up on her chemical avoidance, including NBC's TODAY show. Before you continue, view this 2 minute conversation on TODAY's Health Page. I understand that Kathie Lee and Hoda are personalities,and are encouraged by their producers to engage in negative chatter, but the segment saddens me for a number of reasons. 1. Jacquelyn is a real person with real feelings. She is doing her best to raise her kids in a chemically crazed culture. She's even trying to help others do the same. Kathie and Hoda, even if you don't understand her perspective, must you demean a young mom in this way? 2. Their conversation perpetuates the belief that chemicals have no consequences. We've been told we need to use multiple personal care products every day. Our generation represents a giant experiment when it comes to the use of chemicals on our bodies,and ills like endocrine disruption. Skin flora erosion and cancer are now linked to petroleum based substances such as DEA, 1-4-dioxane, and toulene. 3. I relate to Kathie Lee and Hoda. I might not have said it, but I thought people like Jacquelyn (and now me) were crazy. I dismissed them. I viewed them with disdain. Only my family's health crisis led me to re-evaluate my presumptive conclusions. Watching Kathie Lee and Hoda reminds me that I can be, and have been, insensitive and oblivious to the feelings of others. 4. Most women in the world can't afford perfume and personal care products. 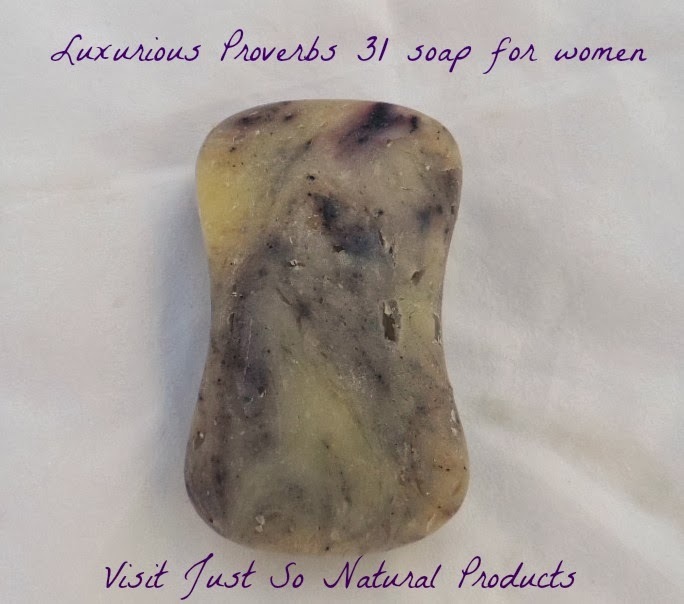 The average American woman uses 12 different products every day according to the Environmental Working Group. The average teenage girl uses 17. While affordable to most in America, women around the globe are too busy struggling to survive and care for their children. The one person I don't feel sad for is Jacquelyn. While I'm sorry she had to endure this type of treatment, I'm confident she is ahead of the game. Thinking outside of the box for herself and her family will yield great benefits. I hope her blog grows by leaps and bounds because of this publicity. Meanwhile, I’ll keep washing my hair with mud. I say mud because I use rhassoul clay and that's what it feels like when I mix it with water. But again, please don’t mention this to Kathie Lee or Hoda. Oh, and between you and me, my hair has never felt better, and no one has complained of any odor. See more about rhassoul clay in this post, and more about natural shampoo alternatives here. 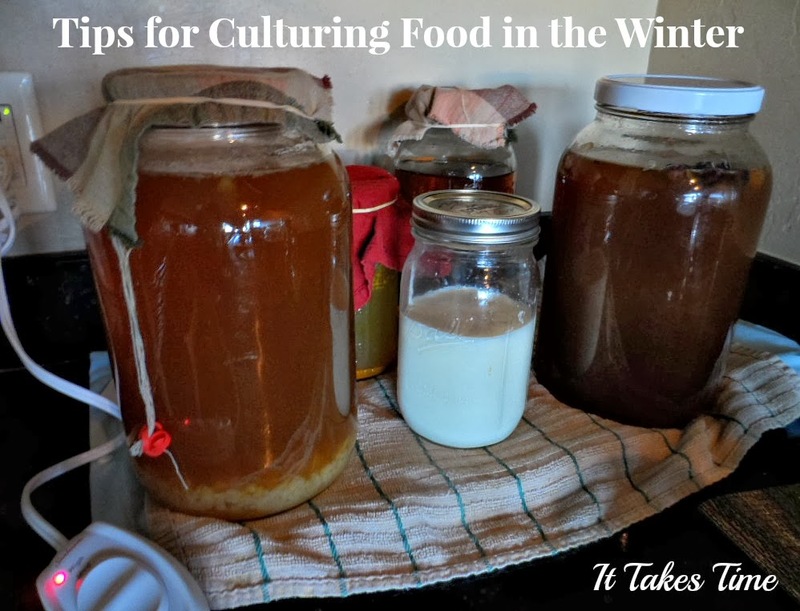 If you make foods like sauerkraut, kefir and kombucha, chances are you've noticed a change in the way your foods culture during the winter. Cooler indoor air temperatures can slow the growth of the bacteria and/or yeasts. Optimal temperatures vary, but most microbes enjoy what we enjoy - in the mid 70s to 80. I don't know about your house, but our house frequently goes below 70 degrees in the winter. Before I discovered the technique pictured above, I noticed a much sweeter taste in my water kefir, letting me know that my grains were struggling. I had two choices - either lengthen the time of fermentation, or increase the temperature. I added the heating pad and my water kefir has returned to its usual tang. Since my heating pad is new, the lowest setting works best. Older heating pads may work best at the medium or high settings. I ordered one without the automatic shut off since I don't want to worry about keeping it on. I found mine here. Increased elevation. If you have a higher shelf in the kitchen, the yeasts and bacteria will enjoy the warmer spot. Oven light. Some oven lights reach a temperature that is too high. Check yours before trying this method. If the temperature is not too high, this can be a great method. Seedling mat. These work similarly to the heating pad, offering warmer temperatures under the jars. Dehydrator. You can place the jars next to a dehydrator that is in use or try putting the jars inside the dehydrator. Again, check the temperatures to avoid overheating.
" I cannot guarantee that cross-contamination among cultures is impossible, but it is not a likely occurrence,and I encourage enthusiastic experimentalists to ferment to your heart's content with out worry of cross-contamination." With these simple temperature control suggestions why not ferment to your heart's content this winter? I have always been skeptical regarding the successful remediation of homes and buildings contaminated with fungi and bacteria from water intrusion. Buildings and homes are complicated structures. The spores of both bacteria and fungi, as well as their by-products (fine particles less than one micron to those equal or greater than the mold spores), are present in dust. The dust can be found in all nooks and crannies of a building, e.g. refrigerator insulation and coils, areas not normally dusted, even in carpeting that has been vacuumed, under carpeting, and in wall cavities. Finally, little attention is paid to the contaminants in buildings that result from Gram negative and positive bacteria. Two buildings in Bermuda. These buildings had been remediated prior to our testing. Also, just before we arrived to do testing, the buildings had been cleaned and painted. Aggressive air sampling revealed the presence of hidden fungal spores up to 150,000 spores per cubic meter. Q-PCR revealed the presence of Stachybotrys and several species of Aspergillus and Penicillium, along with other fungi. Culturing for presence of bacteria revealed pathogenic Gram negative and positive bacteria. Interestingly, the occupants of one building had recurrent episodes of food-like poisoning (diarrhea and lower abdominal cramping and pain). In this building we detected high levels of Bacillus cereus, a bacterium that causes food poisoning. Also, we found high concentrations of endotoxins (lipopolysaccharides) released by Gram negative bacteria. Moisture measurements revealed moisture content of walls from 58% to 98% in both buildings. Finally, disturbing the air around a work station that had computers produced spores of Stachybotrys at 7,000 per cubic meter. Thus, workers pounding on keyboards most likely were inhaling these spores along with finer particulates. Samples of dust were positive for endotoxins and 2-3-beta-D-glucans. House that had been remediated twice. The occupants were still ill. Moisture measurements showed moisture was coming up through the cement slab, which had numerous cracks. This was in all rooms of a 4-bedroom home. Q-PCR revealed Stachybotrys, several species of Aspergillus and Penicillium in three different dust samples (carpeting, living area, kitchen cabinet dust). Results for endotoxins were elevated. Mycotoxins were detected in the dust. Two windows had evidence of elevated moisture content below the window. Tests revealed wall cavity fungi that were active and grew when cultured. Gram negative and positive bacteria were cultured from dust. The fireplace area with a TV alcove had high moisture content with Stachybotrys present (this had been previously remediated). The master bath still had high moisture content with Stachybotrys isolated (this had been remediated). The moral of this story is to check cement slabs as well as check below every window in the home. I have done other homes with similar results. I always culture for bacteria and endotoxins, test for mycotoxins, and do Q-PCR on several different dust samples. We have to remember that air spore counts alone do not tell the story. The fine particulates (less than one micron) have been shown to be up to 500 times more concentrated than the airborne spores. The fine particulates contain the antigens and toxins. Finally, recent peer-reviewed literature has shown that the bacteria in water-damaged structures also release toxins into the indoor environment. Therefore, both bacterial and fungal toxins are present and should be considered in risk assessments with respect to animal and human health. People who are genetically challenged would be those who are genetically susceptible to such exposures. This would involve not only HLA genes but also genetic polymorphism of detoxification pathways such as Glutathione transferases and Cytochrome P450. Thus these people should receive full disclosure when renting or buying. Mold - Where Do I Begin? You suspect mold in your home. Someone in your family has symptoms that baffle doctors. Where do you start? Here are some suggestions. I am a former journalist and the mother of nine children ranging in age from 28 to 12. My husband Chris, myself, and our children find ourselves in the desert of Arizona attempting to rebuild our health and our lives following a massive toxic mold exposure. The organization momsAWARE comes out of this crisis as a means to help educate and empower others on the subject of environmental health. Our family has also launched a natural line of personal care products called Just So, available at our Online Store. Horopito, Olive Leaf Extract, Pau d'arco, Garlic, and Grapefruit Seed Extract are a few of the natural antifungals. Add borax and/or white vinegar and/or baking soda to your laundry. These are all excellent antifungal agents. Chlorine bleach will not kill the toxins produced by mold. In fact, the chlorine makes the toxins more lipid soluble. The toxins then penetrate the skin more readily. Ventilate your home whenever possible. If you have an opportunity to open a window even for an hour it is healthy. Stagnant air is like stagnant water. In 1999 the Mayo Clinic released a study implicating fungus as the primary cause of chronic sinus infections. 96% of those studied showed high counts of mold spores in their nasal passages. Do not ignore any water intrusion in your home. My husband Chris and I co-host Building Relationships with Dr. Gary Chapman, a weekly broadcast heard on Moody Radio. We also have fun doing our Toxic Talk Tuesdays on Chris Fabry Live. All Amazon purchases linked from It Takes Time help support the efforts of momsAWARE. If I must leave a contaminated environment, what can I take with me? What must I leave behind? What can be cleaned? Some thoughts, based on our experience, here. 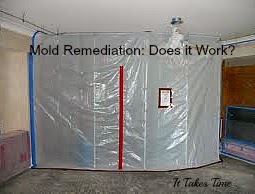 There are a wide variety of treatment options for mold exposure. Here is an overview to provide a starting point for further research. © 2013 It Takes Time . All Rights Reserved. Site by Friendlier Design.